The worlds leading consumer health and hygiene company, manufacturers of extremely well-known products such as Dettol, Nurofen, Scholl, Harpic, Strepsils and Gaviscon, to name but a few, are building a new state of the art R&D Centre in Kingston Upon Hull. The new facility will be an innovation hub, enabling RB to carry out industry- leading scientific research and development, to create new product ranges and healthcare solutions that could help transform lives in the future. The main contractor is The M&W Group and client architects are PM Devereux. FDP Architects are working with the main contractor. 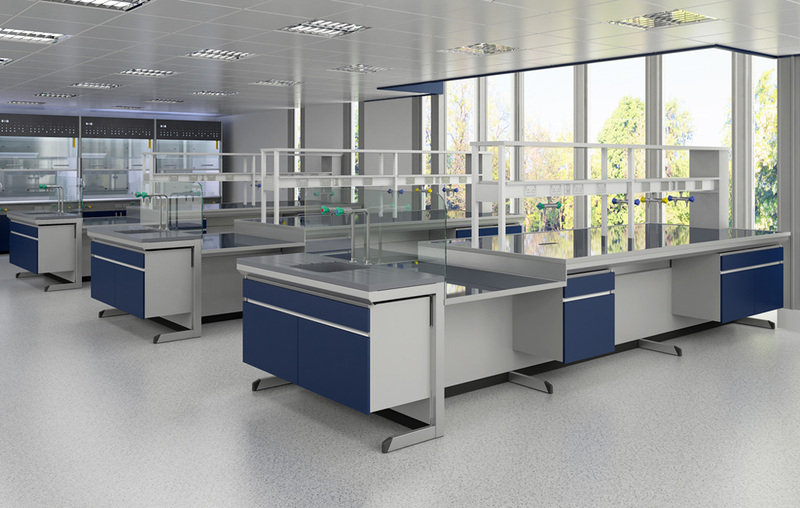 S+B has secured the contract to manufacture and install the laboratory furniture and fume cupboards in the face of strong competition from local and overseas suppliers. As is often the case with projects of this size and type, cost saving options for the lab furniture were tabled by S+B and others, but the whole client team and their appointed consultants were determined that there would be no compromise to the styling and build quality of this crucially important element of the facility interior where scientists will be working for many years to come. The client team not only wanted something which is highly functional and durable, they also wanted a level of professional styling which is consistent with the image that a world leading blue chip company wishes to present to it`s employees, suppliers and not least to it`s customers. The S+B Exemplaire C Frame Lab Furniture System was chosen because of it`s build quality, unique features such as the height adjustable floor seal and the state of the art modern and inspiring working environment which it would help create to attract, stimulate and inspire a team of highly qualified professional researchers and development scientists. Trespa Toplab Base worktops were chosen for the excellent general qualities and appearance. Ecoline Fume Cupboards will be supplied with the laboratory furniture to further aid the objective of ensuring a fully integrated and professionally styled interior results rather than a mismatch of different products sourced from different suppliers lacking any synergy in design.